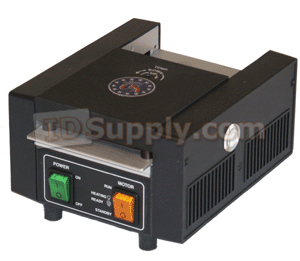 L5500T 5" Pouch Laminator Machine is designed for smaller ID cards up to 4-7/16”wide. The laminator includes a thermometer, adjustable temperature, and also has four rollers to ensure the laminate does not bend or curl. Fan cooled outlet table, positioned to prevent “lost” cards. Finned heat sink for additional cooling. Illuminated power switches serve as a reminder and warning. Brushless gear motor for long trouble free life. All electrical components are mounted to grounded chassis. Molded silicone rollers withstand elevated temperatures.